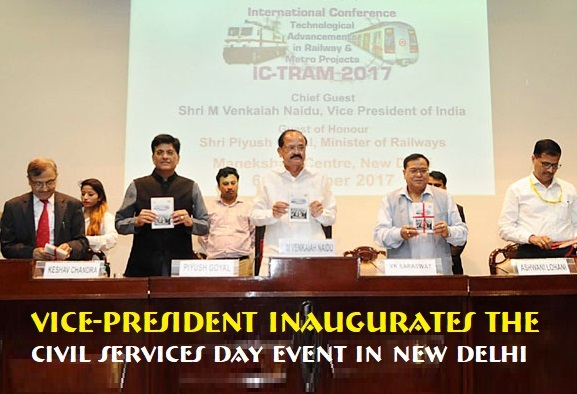 Vice President M. Venkaiah Naidu has inaugurated the two-day Civil Services Day (12th) event in New Delhi. Naidu also released a book Emulating Excellence- Takeaways for Replication'. The day is celebrated for the civil servants to rededicate themselves to the cause of citizen and renew their commitments to public service and excellence in work. He also inaugurated an exhibition put up by Department of Administrative Reforms and Public Grievances on identified priority programmes and innovations. The minister of State for Parliamentary Affairs Vijay Goel has inaugurated the new office of Central Project Monitoring Unit for the e-Vidhan project of the Government at the Parliament House Annexe. The 'e-Vidhan' is a mission mode project to digitize and make the functioning of State Legislatures in the country paperless. This was done as a part of Swachhata Pakhwada (16-30) being observed by the Ministry of Parliamentary Affairs. The Ministry of Parliamentary Affairs is the Nodal Ministry for the project and it is taking all necessary steps for rolling out the Project in all the States. The Gujarat chief minister Vijay Rupani launched ‘Pocket Cop Project’, under which 4900 smartphones with mobile internet connectivity will be handed over to investigating officers. The smartphone will have four data-rich applications loaded for passport verification, the search of criminals, missing persons and stolen vehicles. It will be given to the police personnel, including every police station in-charge, investigating officer, PCR van, and those involved in passport verification. The External Affairs Minister Sushma Swaraj left for China to participate in a meeting of the foreign ministers of the Shanghai Corporation Organisation (SCO). She will hold talks with her Chinese counterpart Wang Yi. The visit is aimed at elevating the China-India strategic cooperation partnership. The first official World Creativity and Innovation Day (WCID) has been celebrated to raise awareness of the role of creativity and innovation in problem-solving and by extension, in the implementation of the Sustainable Development Goals. On this day the world is invited to embrace the idea that innovation is essential for harnessing the economic potential of nations. One of the world's biggest dance music stars, Swedish DJ Avicii (Tim Bergling ) passed away in Muscat, Oman. Chief Editor of leading Malayalam daily 'Kerala Kaumadi', MS Ravi (68-year) passed away at a private hospital in Thiruvananthapuram. He was Son of Kerala Kaumadi's founder editor K Sukumaran. He was actively involved in socio-cultural activities and was the recipient of several awards. Britain’s Prince Charles (69-year) will succeed his mother Queen Elizabeth II as the Head of the Commonwealth after the heads of government agreed on his succession. The Head of the Commonwealth is recognized by the members of the Commonwealth of Nations as the "symbol of their free association" and serves as a leader. The Head of the Commonwealth or a representative attends the biennial Commonwealth Heads of Government Meeting (CHOGM), held at locations throughout the Commonwealth. Note: The Commonwealth is an intergovernmental organization of 53 members states that are mostly former territories of the British Empire. After the secret vote in Cuba’s national assembly, Miguel Diaz-Canel (57-year) was formally named the new president of the country. He was selected by a vote of 603-1 (in the National Assembly) as the unopposed candidate to replace Raul Castro (86-year). on 24 February 2013, Mr. Diaz- Canel was elected as the first Vice President of the Council of State. Note: The Republic of Cuba is located in the northern Caribbean where the Caribbean Sea, the Gulf of Mexico, and the Atlantic Ocean meet. The Table Tennis Federation of India (TTFI) has recommended Manika Batra (22-year) for the prestigious Arjuna Award. She is country's only quadruple medallist at the 21st Commonwealth Games in Gold Coast. Batra single-handedly taking India to a maiden team gold before winning a singles gold, another first. She also secured a women's doubles silver alongside Mouma Das and mixed doubles bronze with G Sathiyan. Bengaluru FC has won the inaugural edition of the Super Cup football tournament at the Kalinga Stadium in Bhubaneswar. They defeated Kolkata football giants East Bengal by a convincing margin of 4-1. Now, Bengaluru maintained their record of winning a trophy in each of the five seasons they have been in existence. The 2018 Indian Super Cup is the inaugural edition of the Super Cup, the main club knockout football competition in India.